It's a Sunday morning and I was headed to church. When I got there, the ushers were gone and the doors were closed. The church closed its doors on me. God closed His doors on me. Ok ok. So I was being melodramatic there. The truth is that we were late. If you don't recall my peeve with being late for Church, read here. I woke up at about 8.40am and Faith was still nua-ing in bed. We left her behind the Sunday before when she couldn't wake up. She freaked out about being abandoned eventhough Grandpa and Grandma were around. So I reminded her that I will not hesitate to ditch her again if she don't get her arse off the bed at that very instant. Next came the f*ck thing where I got chided by the wife for talking to my kid in a threatening fashion. HARLOW!!?? Like this call threatening? I call it stating matter of factly. Welcome to the world we call the harsh reality of society. People get left behind when they can't keep up. Yes, society do, from time to time, lend a hand to the unfortunate and pull them along. But if you are able-bodied and you are not keeping up, society is more than happy to see you rot in the dumpster and possibly drop a couple of rocks while you are down there. So anyway, it was almost 10.30am by the time we got out the door. Do they expect me to get to Barker Road from Seng Kang is under 5 minutes? OK, so perhaps we don't need to get in before 10.30am. We usually get in before 10.45am where the Praises were still going on and the sermon has not started. The standard modus operandi is that I will drop them off at the elevator before I go search for the parking spot. I dropped them off today at 10.50am and by the time I parked my car and walked to the Sanctuary, the ushers were gone and the doors were closed. Granted that I could easily just open the door and enter, I ish already sian half with the whole idea of attending church. I thought Sunday Church was supposed to be a happy event for the family to be together. Instead, why do I end up feeling so much resentment each time (which is rather often) we were late? Seriously, I am contemplating giving up the idea of attending Church altogether as it is giving more grief than joy. It upsets me which in turn upsets the whole family. I think we'd all be happier if we can all sleep in together. Wake up so early for what? Alternatively, perhaps I should just leave the car keys with the wife and let her drive and keep her own time. Then perhaps I can set off way earlier in the morning to explore the old kopitiams, markets and/or hawker centres* en route. Enjoy a good breakfast, good kopi-o gao with the morning papers AND still be on time? Perhaps the family should only get together at noon time when we meet at the front door AFTER the service. 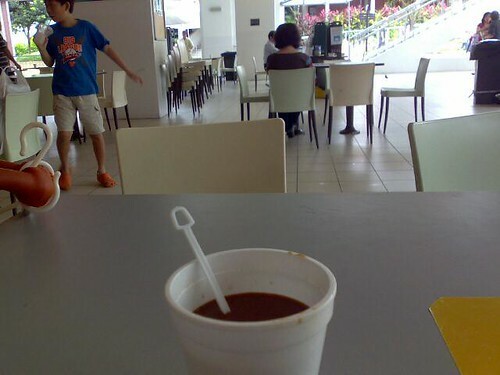 * Was at Lorong 5 Toa Payoh hawker centre. A quaint little forgotten place. Took a couple of pictures which I will post tomorrow. aye find a later service. Some churches got 1130am one. Chill dude, the doors may have closed but God is always waiting for you outside. Vandalin & ruok: Trust me, even if we move to a later service, we will still be late. It is not the timing of the service but the thoughtlessness of the people keeping time. Sunflower: I was with friends lor. I am at Lor 1 for my weekly tennis everyday Saturday from 12 to 6 or when we run out of natural light. It's funny that when I was driving past your place, I was pointing out to my friends that you lived there (pointing at your block). tssd: I think the method that worked on Faith should work on the family. If Faith gets left behind for not keeping time, then perhaps the family gets left behind for not keeping time too? Well kids will be kids.... why don't you just go to church separately so that you can avoid upsetting everyone. reasons why i attend the 5pm service... =) anyway i hope you're more chill now dude, my family doesn't even consider going to church at all so i guess you're better off in that sense. families are all like that one. my family too, keep "tu-ing" like siao. Mistress Grace: Kids the real time keepers if you think about it. Ǝ: Trust me, it's futile. It is not the timing of the service that is the problem. Even if we attend the 5pm service, we would probably arrive at 5:30 to 6pm. tssd: Perhaps I should go there on my own and leave the car keys with the family and meet them after the service. I remember growing up and having screaming matches at my sisters to get out of the bathroom and basically, there was always mayhem every Sunday getting to church. It was very important for us to get to church early. And now, we still have the same problem, hubby and me. Especially after a late night out on Sat. But I guess, deep inside, we understand and realise that if God can sacrifice His Son for us, what's waking up early on Sunday to go to church compared to what He has done. And the attitude towards God is so important. I look it as, if I don't get to work late everyday, why then should I be late to meet God once a week? Is God less important than school, work, or anything for that matter? Where is God in my priority list. Sorry for sounding so preachy.....Maybe you could explain to Faith and your wife, your views on this. Hubby and me had issues about going to church on time and its only after numerous discussions that he was able to see my view. Faith: Believe me, I tried. It's always the convenience shift of the blame to the kids. I give up liao. It seems like you are very pissed. Anyway dropping by. Yes, i think you should just go church on your own. Obviously your family don't share the same feeling of being to service on time and forcing them only get the situation ugly. Mootq: I am beyond pissed until I don't feel anything left. My church friends were surprised to see me sitting outside. I just told them I didn't go in because I was late. I was surprised that I was so calm about it. Not angry, not pissed, not flustered. Perhaps sitting outside to cool my head was good in the end for me. Chocolate Gal: For once, I actually agree 100% with what you said. the point is that they aren't really bothered if they are late, and you are. Their actions are stumbling you in your walk. So, ownself walk. Giving up church altogether becos ur family is late? sounds like an excuse to run away from 1) teaching faith to have more er...faith and 2) communicating with your wife on raising kids. Eventually if its not church, it will be something else. so dun miss church, man, that's not the issue. TSSD: You are right. My walk is my walk. akk: Not my intention to miss church. I think I will just do what TSSD suggest. Go there on my own. They want to come or not, don't care liao. happy new year! I think given that Faith is of an age where you can reason with her, you should explain how important it is to be on time - just like it's important for her to be on time for the school bus and then for school, and for you to be on time to get to work (or on time to get to airport to go on holiday etc). if that doesn't work then next sunday, just get up and go to church and leave the family behind, but not with any vindictiveness though, otherwise, it's quite pointless to go to church with meanness in your heart. or, find a church that's nearer to your house. Plenty of people move churches after they've moved house, get married etc. there's no harm at all in finding a new church that's nearer. it might actually build community spirit! alternatively, you can work backwards from the time of service, and tell Faith to be up by say 9.30am to be ready to leave the house at 10. that way, she doesn't have to wake up as early as you do, and you can get ready her breakfast, her clothes, bag etc etc to get out of the house on time. that's what we do every morning. G may/not wake up the same time as us, so we get up first, get ourselves sorted (shower, clothes, food, bag packed), and then when it's time to go, if he's awake great, if not we move him straight to the car. What for once??? #%?^#&#.. we agree alot mah.. LOL.. okie lah, u happy can liao..
Don't give up. I guess it can be hard with kid. Me no kids.....so can't say much on that. But I believe that if you persevere and continue to explain and be long winded, and pray about it. Someday, your kids and wife will come around. Have faith!